PARI Project Secures Funding for a Second (three year 2018 – 2020) Phase. The partners of the Program of Accompanying Research for Agricultural Innovation (PARI) converged at the Hilton Hotel in Nairobi, Kenya from 8 to 9 December 2016, for the PARI Annual Research and Planning Meeting 2016. PARI is a research program within the “One World – No Hunger” initiative of the government of Germany. Its goal is to promote sustainable agricultural growth and food security objective by fostering the up-scaling of agricultural innovation in Africa and India, through research activities that inform the direction of investment for innovation. It is implemented in 12 African countries, India, and Germany. This implementation is co-led by three organizations, namely the Centre for Development Research (ZEF), Forum for Agricultural Research in Africa (FARA), and the International Food Policy Research Institute (IFPRI) working is close collaboration with the German Agency for International Cooperation (GIZ)-led Green Innovation Centres. PARI’s partnership model entails joint research activities around thematic areas, it also allows for country partners to pursue research programmes of priority to their national agricultural food security and investment plans (NAFSIPs) as well as regional and continental frameworks. From Africa: (FARA, African Growth and Development Policy Modeling Consortium facilitated by IFPRI (AGRODEP/IFPRI), and National Agricultural Research Services (NARS) from Benin (INRAB), Burkina-Faso (INERA), Cameroon (IRAD), Ethiopia (EDRI), Ghana (CSIR), Kenya (KALRO), Malawi (DARS), Mali (IER), Nigeria (ARCN), Togo (ITRA), Tunisia (INRAT), and Zambia (ZARI). The meeting comprised plenary presentations, roundtables, and panel discussions on achievements and how partners can guarantee the impacts of the PARI program. The partners discussed the vision for African agriculture, the roadmap for implementing the Malabo declaration, and G7 commitment to the development of African agriculture thereby, providing partners an opportunity to network and learn from one another. 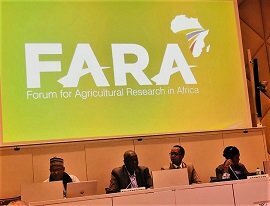 Participants undertook to deepen collaboration amongst themselves through, for example, harmonizing approaches to research and documentation; and by stimulating effective investment in (scaling of) agricultural innovations across Africa. They also agreed to launch a Farmers’ Innovation Contest across six (6) West-African PARI countries (Benin, Burkina-Faso, Cameroon, Mali, Nigeria, and Togo), in 2017. This contest aims at publicizing, documenting, and deepening research of farmers’ innovations. In recognition of the successful implementation and outcomes flowing from the first phase (2015 – 2017) of the program, the German Government approved the extension of the PARI program for a second three year phase (2018 – 2020). This extension was announced during the meeting.